American physician payload specialist astronaut 1991-1998. Active Payload Specialist Trainee for Shuttle STS-90 Neurolab Mission; he had been Alternate Payload Specialist for STS-58 Mission SLS-2. Status: Inactive; Active 1991-1998. Born: 1956-06-06. Spaceflights: 1 . Total time in space: 15.91 days. Birth Place: New York, New York. Born June 6, 1956 in New York, New York. His parents, Jay Sr. and Jean Buckey, reside in Ft. Myers, Florida. Married to the former Sarah Woodroffe Masters of Summit, New Jersey daughter of Parke and Margaret Masters. They have one son and two daughters. Recreational interests include camping, history. Graduated from W. Tresper Clarke High School in Westbury, New York, in 1973. Earned a bachelor of science degree in electrical engineering from Cornell University in 1977, and a doctorate in medicine from Cornell University Medical College in 1981. Interned at New York Hospital-Cornell Medical Center, and completed residency at Darmouth-Hitchcock Medical Center. NASA Space Biology Fellow at University of Texas (UT) Southwestern Medical Center. American Society for Gravitational and Space Biology (Executive Board Member 1991-1994), Aerospace Medicine Association, and American College of Physicians. Meritorious service award from the University of Texas for work on Spacelab Life Sciences-1 (SLS-1) (1991), Outstanding Teacher Award from the Class of 1994 at UT-Southwestern, Distinguished Graduate USAF School of Aerospace Medicine Primary Course (1987), two NASA Certificates of Recognition for hardware developed for SLS-1, NASA Biology Fellowship (1982), Thora Halstead Young Investigator Award, 1994. Dr. Buckey has over 20 publications in the areas of space physiology, cardiovascular regulation and echocardiographic techniques. Medical internship, New York Hospital-Cornell Medical Center, New York, 1981-1982; NASA Space Biology Fellow, UT-Southwestern, 1982-1984; Research Instructor, Department of Medicine, UT-Southwestern, 1984-1986; Assistant Professor Medicine, UT-Southwestern, 1986-1994; Associate Professor Medicine, UT-Southwestern, 1995; Medicine Resident, Dartmouth-Hitchcock Medical Center, 1995-1996. Associate Professor of Medicine, Dartmouth-Hitchcock Medical School, 1996-present; Flight Surgeon, U.S. Air Force Reserve, 457th Tactical Fighter Squadron at Naval Air Station Joint Reserve Base, Fort Worth, TX, 1987-1995. 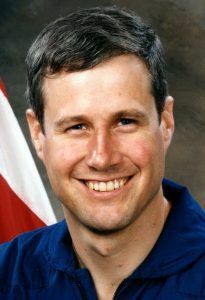 Dr. Buckey is on leave from Dartmouth Medical School to train as a Payload Specialist for the Neurolab mission, STS-90. Co-investigator and project manager for the space flight experiment "Cardiovascular Adaptation to Zero-Gravity;" Spacelab Life Sciences-1; Alternate Payload Specialist, Spacelab Life Sciences-2. Dr. Buckey will serve as a payload specialist on STS-90 Neurolab, a 16-day Spacelab mission dedicated to investigations on the effects of microgravity on the nervous system. Launch is targeted for April 1998. Family: Astronaut. Country: USA. Flights: STS-90. Projects: STS. Agency: USAF. Bibliography: 12, 5215. 1956 June 6 - . Birth of Jay Clark Jr Buckey - . Nation: USA. Related Persons: Buckey. American physician payload specialist astronaut 1991-1998. Active Payload Specialist Trainee for Shuttle STS-90 Neurolab Mission; he had been Alternate Payload Specialist for STS-58 Mission SLS-2. 1 spaceflight, 15.9 days in space. Flew to orbit on STS-90 (1998). 1998 April 17 - . 18:19 GMT - . Launch Site: Cape Canaveral. Launch Complex: Cape Canaveral LC39B. Launch Platform: MLP2. LV Family: Shuttle. Launch Vehicle: Space Shuttle. STS-90 - . Call Sign: Columbia. Crew: Altman, Buckey, Hire, Linnehan, Pawelczyk, Searfoss, Williams, Dave. Backup Crew: Dunlap, Mukai. Payload: Columbia F25 / Spacelab LM Eurolab. Mass: 115,900 kg (255,500 lb). Nation: USA. Agency: NASA Houston. Manufacturer: Bremen. Program: STS. Class: Manned. Type: Manned spaceplane. Flight: STS-90. Spacecraft Bus: Shuttle. Spacecraft: Columbia. Duration: 15.91 days. Decay Date: 1998-05-03 . USAF Sat Cat: 25297 . COSPAR: 1998-022A. Apogee: 274 km (170 mi). Perigee: 247 km (153 mi). Inclination: 39.00 deg. Period: 89.70 min. Two Get Away Special beams with canisters G-197, G-467, G-772 (Colorado's COLLIDE experiment, which collided small particles into each other to simulate the formation of planets and rings). The Neurolab mission was managed by NASA-Johnson at Houston, unlike earlier Spacelab flights which were NASA-Marshall/Huntsville's responsibility. Landed at Kennedy Space Center May 3 1998. 1998 May 3 - . Landing of STS-90 - . Return Crew: Altman, Buckey, Hire, Linnehan, Pawelczyk, Searfoss, Williams, Dave. Nation: USA. Related Persons: Altman, Buckey, Hire, Linnehan, Pawelczyk, Searfoss, Williams, Dave. Program: Spacelab. Flight: STS-90. STS-90 landed at 16:09 GMT. .